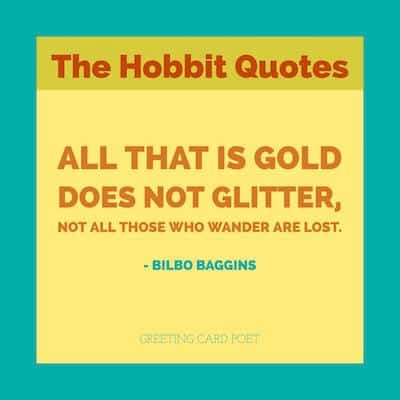 It makes sense that The Hobbit quotes with their deep meaning come from a classic source book. Anyone who has ever read The Hobbit or There and Back Again knows that their soul never returned from the Shire. With dwarves, dragons and action, fiction could hardly ever be so mesmerizing and soothing. Of all the great warriors and legends, the great Gandalf found courage and inspiration in one of the most unlikely of souls – a little hobbit from the Shire. In a world full of evil and insurmountable powers, J.R.R. Tolkien places all the world’s hope in one loving and caring Hobbit. 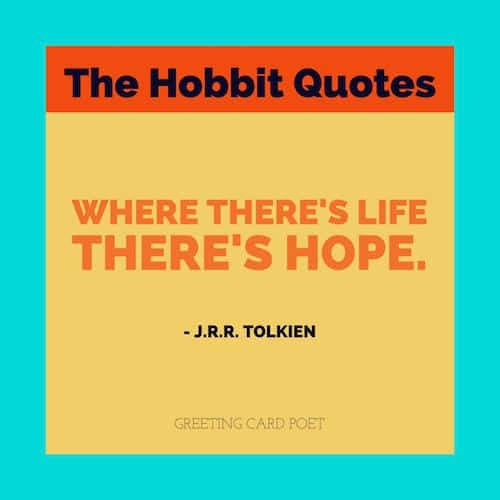 Here are some inspirational and deep The Hobbit quotes featuring its key characters like Frodo and Bilbo. Even when those words were written for a different world, they still hold a lot of significance in our neck of the woods. 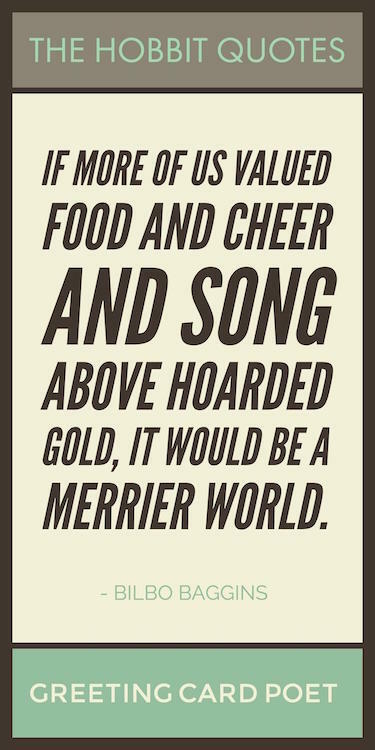 If more of us valued food and cheer and song above hoarded gold, it would be a merrier world. But, sad or merry, I must leave it now. Farewell. There is a lot more in him than you guess, and a deal more than he has any idea of himself. You may (possibly) all live to thank me yet. Where there’s life there’s hope. It is useless to meet revenge with revenge: it will heal nothing. Victory after all, I suppose. Well, it seems a very gloomy business. We are plain quiet folk and have no use for adventures. Nasty disturbing uncomfortable things. Make you late for dinner. I can’t think what anybody sees in them. Bother burgling and everything to do with it. I wish I was at home in my nice hole by the fire, with the kettle just beginning to sing. Now I know what a piece of bacon feels like when it is suddenly picked out of the pan on a fork and put back on the shelf. Never laugh at live dragons, Bilbo you fool. I don’t want any adventures, thank you. Not today. Good morning. But please come to tea – any time you like. Why not tomorrow? Come tomorrow. Go back? No good at all. Go sideways? Impossible. Go forward? Only thing to do. On we go. If ever you are passing my way, don’t wait to knock. Tea is at four; but any of you are welcome at any time. 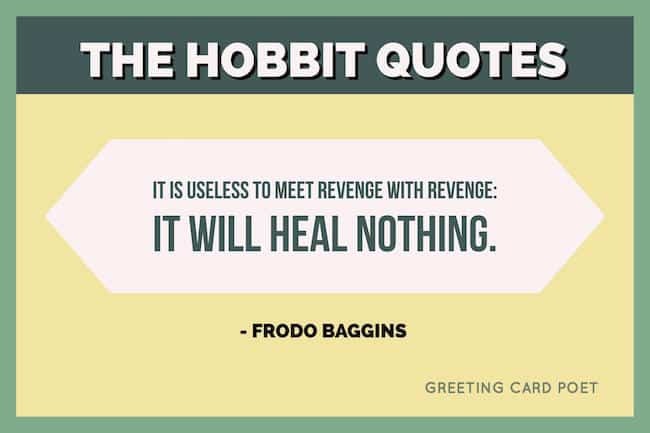 Tip: These The Hobbit quotes make great captions on social media. I will not risk this quest for the life of one burglar. We kill the dragon. If this is to end in fire, then we will all burn together. No. I will not die like this, cowering, clawing for breath. You can listen to this naysayer, but I promise you this; if we succeed, all will share in the wealth of the mountain. You will have enough gold to rebuild Esgaroth ten times over. Those who have lived through dragon fire should rejoice. They have much to be grateful for. I would not trust Thranduil, the great King, to honor his word should the end of all days be upon us. You lack all honor. I have seen how you treat your friends. Watch the Hobbit: Learn more about The Hobbit Movies. I will take it – I will take it. I will take the Ring to Mordor. Though… I do not know the way. It must often be so, Sam, when things are in danger: some one has to give them up, lose them, so that others may keep them. I’m glad to be with you, Samwise Gamgee, here at the end of all things. And here he was, a little halfling from the Shire, a simple hobbit of the quiet countryside, expected to find a way where the great ones could not go, or dared not go. Short cuts make delays, but inns make longer ones. I am commanded to go to the land of Mordor, and therefore I shall go, if there is only one way, then I must take it. What comes after must come. I would rather see him than all the towers and palaces in the world. Read more about The Hobbit here. Can you answer these riddles that Gollum posed to Bilbo Baggins? All in mail never clinking. 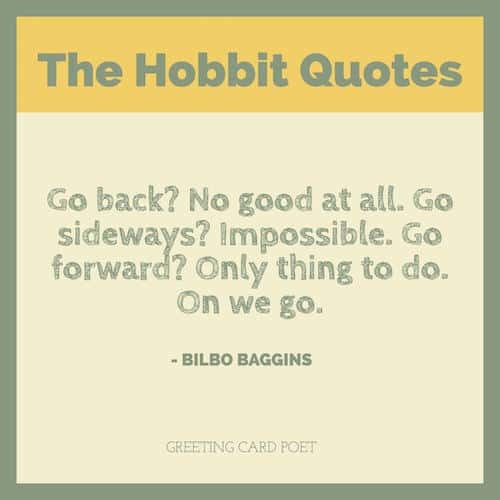 If you have suggestions for The Hobbit quotes, please let us know via the Contact page. Thanks.